Crackers are perfect to fill your vending machines and concession stands with. They are filling and patrons love these classic treats. Campbell's Pepperidge Farm Cheddar Cheese Single Serve Cracker 0.5 Oz. Campbell's Pepperidge Farm Cheddar Cheese Single Serve Cracker 1 Oz. 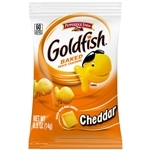 Campbell's Goldfish Pepperidge Farm 100 Calorie Whole Grain Cheddar 0.75 Oz. Campbell's Pepperidge Farm Flavor Blasted Goldfish Hot and Spicy Cheddar Cracker 0.75 Oz. Campbell's Goldfish Whole Grain Cheddar Snack 0.75 Oz. Kelloggs Keebler Austin Zoo Animal Crackers 1 Oz. Kelloggs Keebler Sunshine Cheez It Vending Cracker Single Serve - 1.5 Oz. Nabisco Nutter Butter Cookie Bites - 1 Oz. Nabisco Ritz Bits Sandwich Cheese Single Serve Tray Pack - 1 Oz. Nabisco Ritz Bits Sandwich Peanut Butter Single Serve Tray Pack - 1 Oz. Stauffers Animal Crackers - 1 Oz. Cheez-It Original Whole Grain Cracker - 0.75 oz. Pepperidge Farm Crackers Whole Grain Cheddar - 1 oz. Nabisco Barnums Animal Crackers Zoo Animals - 1 Oz.